It’s hard to remember that over 20 years ago cell phones were mainly used for emergency purposes and looked like walkie-talkies; think the Nokia 9000 which was one of the first mobile “great communication enablers.” In 1996, Hotmail’s free email service was introduced, growing from zero to 30 million active users in 2.5 years, which of course was used to exchange “important” and countless cat pictures. In 1999, one of the first free SaaS collaboration tools was launched, MSN Messenger, which grew to 300 million global users by 2011 while Hotmail grew to 350 million global users by that same year. As a cloud c-store technology provider who started to develop its first SaaS solutions during the late 1990s, Petrosoft is well aware of the limitations of mobile and SaaS during this period as well as the advancements in technology over the next decade. For example, in 2007, Gen Xers were the first generation to become attached to, if not obsessed with, their mobile phones for emailing and texting, leading some to develop high-tech injuries such as “BlackBerry thumb.” Gen Xers became an example to look up to and follow for the next generation, the millennials. In that same year, both the first iPhone and Android operating system were introduced adding new capabilities and uses. In 2008, texting surpassed mobile calling for the first time with an average of 357 text messages and 204 phone calls each month. By 2011, teens were sending and receiving 3,417 text messages per month. These teens were the first generation who grew up using their mobile phone for far more than calls and texting while other generations eagerly adopted these new capabilities. As the adoption of smartphones increased, reaching 92% for the 18 to 29-year-old age group in 2016 and growing overall from 35% in 2011 to 77% by 2016, so did the expectations and demands for its use in corporations to drive collaboration, productivity, revenue, and profits. An additional influence on mobile corporate communication and collaboration has been the growing use of social media which increased from 5% in 2005 to 69% in 2016. Arguably, the greatest impact of social media on businesses is the transparency provided by both the employee and the employer. The bottom line is that for today’s enterprise, mobile technology enables and drives transparent right-time communication to meet corporate objectives while enhancing the company’s performance and brand. 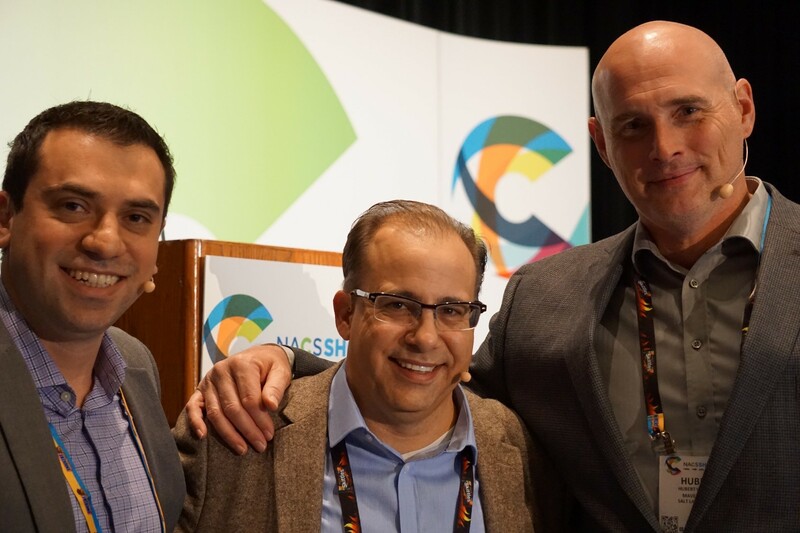 During the NACS 2017 Show, several education sessions were focused on the adoption of mobile technology for convenience store operations and workflows. Some of these were organized through the partnership between Conexxus, the industries technical standards group, and NACS. These sessions were part of the NACS TechEdge education track. One of these mobile enterprise sessions was titled “It’s Time to Mobilize your Workforce and Use Technology to Increase Operations Efficiency” and moderated by Hubert Williams, Connect VP at Maverik, Inc. with Eric Barnes, Senior Manager, Information Technology Engineering at Wawa and Vladik Rikhter, CEO at Zenput as panelists. They discussed the cultural changes and talent needed within convenience store organizations to develop apps that work with or alongside legacy systems. Although the millennial generation has set some expectations for the industry, apps are readily adopted by most of the workforce. The millennial general also lean towards collaboration versus hierarchical for decision making. The greatest example of collaborative decision making that was presented during this session was “shift bidding” also known as self-scheduling. At its extreme, some organizations are allowing their employees to manage their scheduling collaboratively with the agreement that if a shift is missed the employee is terminated. “The processes these apps use may be different but better than the company’s processes as companies who build the apps have a larger pool of examples to pull from. A company should look at its own processes and see if the introduction of a new app, with a new way of doing things through mobile adoption, improves the company. Mobile has become ubiquitous to our employee populations so, as we look to solve process problems, we need to engage not only the left and right side of the brain but the front part of the brain, the smartphone, which people check, on average, every 13 seconds.” Hubert Williams, Connect VP at Maverik, Inc.
Enterprises are lagging in terms of mobile adoption, according to the panel, by possibly more than four years when compared to consumer digital apps and technology. The panel also asked the audience to consider the emotional bond that a mobile user has with their mobile phone when that phone goes dead. The more integral mobile technology becomes to a business, the greater the impact of any failure. These new risks, which include IT adaption and employee adoption, are central concerns. The demand for mobile applications has turned some IT as well as research and development teams on their heads. Not only do they need to learn how to build these applications but also need to create new processes while also being challenged to reinvent their legacy systems. This becomes an issue of cultural change within the organization and the necessity for top-down or bottom-up buy-in for success. The buy-in is crucial to ensure the push and adoption of new processes. While some of these integrations include “light touches” between systems, exchanging very little information and demanding little functionality, others create heavy demands which have proven to be extreme challenges to development teams that lack the expertise to deliver and support these solutions. An approach that can help to change the culture and test a team’s capabilities includes taking one area such as payroll for a proof of concept for a company’s capabilities and adoption. These trials help to create a platform that can scale. According to Eric Barnes, Senior Manager, Information Technology Engineering at Wawa, the focus should be on scale since it is easier to add features and much harder to change the platform. He added that the journey to create this platform is, much of the time, underestimated. It may take 12 months or up to three years. Although new technology to enable convenience store enterprise operations tends to lag consumer solutions, IT and R&D are increasingly feeling the pressure to catch-up to differentiate their brand while also increasing collaboration, productivity, revenue, and profits. The challenges as convenience store enterprises attempt to create and adopt these solutions include buy-in and inexperience at the most basic level. Changes in processes are often also overlooked but these changes may force companies to re-evaluate how they do business in today’s environment. It is ultimately a question of meeting demand and adoption of a new business model driven by solutions which change how a business thinks about their operations, employees, and customers. MELANIE WIDMANN is the VP of Marketing for Petrosoft who provides digital convenience store apps and technology solutions including POS, ordering kiosks, business intelligence, loss prevention analytics, and back-office desktop and mobile apps. She has over ten years of experience marketing software and hardware solutions to the retail and product development industries. She has served as the Chair for Conexxus’ Forecourt Device Controller Working Group, Vice Chaired the Device Integration Committee, and is a Marketing Committee Member. She has also served as a Supplier Committee Member for NACS. Widmann holds a B.Sc. in Finance and an MBA from California State University, Long Beach. Vladik Rikhter, CEO at Zenput, Eric Barnes, Senior Manager, Information Technology Engineering at Wawa and Hubert Williams, Connect VP at Maverik, Inc.